Pope Agatho is known for his deeds suppressed the Monothelite heresy, which was tolerated by previous popes. Pope Agatho played a major role in the Sixth Ecumenical Council (680-681) that was gathered by the Emperor Constantine IV who wanted to heal schism that separated the two sides. Originally Pope Donus had to come to the conference but he was dead when the letter arrived. Agatho seized the olive branch offered by Constantine IV and became a new pope. During the Sixth Ecumenical Council Pope Agatho's letter was read where he explained the traditional belief that Christ was of two wills, divine and human. Agatho's statement was excepted by Patriarch George of Constantinople and the council proclaimed the existence of Christ's two wills. This was the turning point that condemned Monothelitism. Pope Agatho didn't receive the decrees of the Council that ended in September 681 because he had died in January 681. Pope Agatho was venerated as a saint and Roman Catholics celebrate his feast day on January 10. 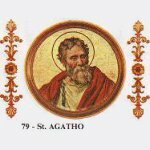 Eastern Christians also celebrate Pope Agatho Feast Day, but they commemorate him on February 20.